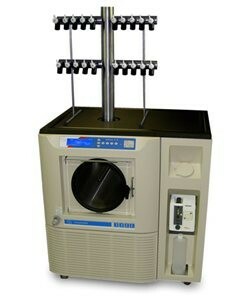 The Freezemobile Large Capacity Freeze Dryer is available with condenser capacities of 25 or 35 Liters. Condenser refrigeration packages of -53, -70 and -85C are available to allow configuration for a variety of solvents. A wide array of manifolds are available including stainless steel and acrylic, tree or drum manifolds, heated or unheated shelves with bulk or stoppering. Hi, It is Freeze dryer VirTis 25 The Sample is melted even in less quantity and external cooling. Pump and condensar are working good. There are no threads in VirTis Freezemobile Reviews at this time.